What would happen to wedding planners if people suddenly stopped having weddings? I had this thought the other day while scrolling through Instagram. A friend of mine, a wedding planner, had posted pictures from a wedding she recently organized. I quickly dismissed the idea. I thought: There will always be weddings because everyone is taught to want marriage. Then, it dawned on me: A lot of people’s jobs depend on the pressure to get married. There are many different kinds of businesses involved in the wedding industry. 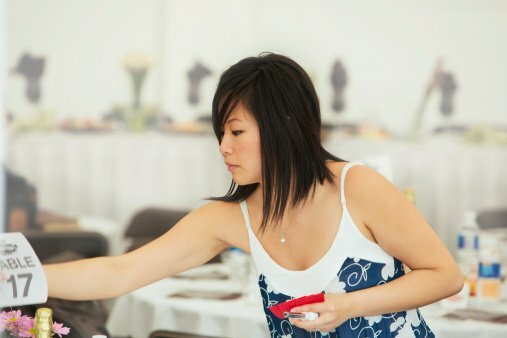 This includes wedding planning and consultancy companies, dressmakers, jewelers, florists, caterers, furniture-staging companies, hotels and other venues, DJs, photographers, videographers, hair stylists, make-up artists, beauty therapists, bridal book and magazine publishers, and so much more. And that’s not to mention the companies involved in honeymoons or gift-giving! All these businesses benefit from the way we’re pressured into getting married. And for this reason, those businesses are all a part of the wedding-industrial complex. But what exactly is the wedding-industrial complex? And how does it relate to social justice? The term industrial complex usually refers to a mutually beneficial relationship between policy makers (usually the government) and various businesses within an industry. The military-industrial complex is probably the most widely discussed industrial complex. This refers to the relationship between a government’s armed forces and the private corporations that profit from the sale of weapons. The relationship between those entities is beneficial because the government benefits by obtaining weapons, and the arms industry benefits by selling weapons. The relationship is said to influence public policy and encourage war. The prison-industrial complex is another example, and one we often discuss in social justice circles. Private prison companies profit from having inmates in prisons. When government officials are influenced by these companies, they’re incentivized to endorse policies that result in more people going to prison. This results in prisons being overpopulated, and certain vulnerable groups – namely people of color, poor people, and immigrants – being targeted by law enforcement. Other examples of industrial complexes include the medical-industrial complex, the education-industrial complex, the sports-industrial complex, and the NGO-industrial complex. In all of those examples, policies – governmental or otherwise – are influenced by industries that profit from exploiting certain people. The wedding-industrial complex might seem relatively harmless in relation to other industrial complexes. After all, the pressure to get married doesn’t seem as directly harmful as starting a war or imprisoning people. But the wedding-industrial complex has some subtle, yet far-reaching effects. This is because it plays into amatonormativity, which shapes the way we view relationships. the assumption that a central, exclusive, amorous relationship is normal for humans, in that it is a universally shared goal, and that such a relationship is normative, in the sense that it should be aimed at in preference to other relationship types. Getting married is often seen as a huge achievement and something everyone should aspire towards. In fairytales, the main character usually only gets her “happily ever after” after she’s married. For couples in relationships, there’s often an expectation that they’ll get engaged after a few years. We’re told we’ll never be happy until we find and marry “the one.” And for those who are married, divorce is often seen as a failure – even if your spouse is abusive, you’re expected to work on the relationship. Amatonormativity, though, isn’t simply about feeling social pressured into getting married. The pressure is also legal and political. In many places around the world, adoption is easier for married couples than single people or unmarried couples. Hospital visiting rights are extended to spouses, but seldom to close friends. Immigration rights are extended to spouses. In many countries, it’s easier to extend healthcare and insurance benefits to your spouse than to a partner you’re not married to – even if they’re dependent on you. Those are examples of how policies can provide married people with certain privileges. That’s amatonormativity. Amatonormativity is harmful because it causes us to set unhealthy relationship expectations for ourselves and for others. It also harms many groups, including aromantic people, non-monogamous people, and people who simply don’t want to get married. Amatonormativity is the social phenomenon that empowers the wedding-industrial complex. In return, the wedding industry perpetuates amatonormativity by reinforcing the idea that marriage is a central and essential part of having a happy, fulfilling, and satisfying life. The two systems work together to send a harmful message to us: To have a good life, you have to get married. To have a good marriage, you have to start off with the perfect wedding. To have the perfect wedding, you have to spend a lot of money. This isn’t to say that individual florists, make-up artists, or caterers are personally responsible for the oppression of aromantic people or any other group. But those businesses form a part of a larger system that reinforces amatonormativity. Amatonormativity and the wedding-industrial complex both perpetuate a number of oppressive ideas. Many feminists have unpacked how weddings can be misogynistic. I don’t personally think weddings are inherently sexist – in fact, they can be quite feminist and socially conscious – but the wedding industry perpetuates a lot of problematic “traditions” that are pretty sexist. Plenty of Western wedding rituals – including the father “handing over” the bride, the bride walking down the aisle towards her husband-to-be – imply that the bride is an object to be given away. Then, there’s the way women are pressured into marriage more than men. While marriage is still expected of men, the pressure on women is a lot stronger. Unmarried men are bachelors. Unmarried women, on the other hand, are spinsters. The traditions also assume that one partner is a woman while the other is a man. This is being challenged by the call for “marriage equality” – but even that has come at a cost: In queer communities all over the world, but especially in the US, the call for “marriage equality” has eclipsed other issues in the queer community. Don’t get me wrong – obviously marriage equality is good. But there are issues that demand more immediate attention, such as queer and trans youth homelessness. Additionally, the queer community also needs to fight against police brutality, demand access to adequate medical care, and find solutions to the high rate of murder of trans women, particularly trans women of color – all issues that affect the most vulnerable members of our community. Despite having these issues on our doorstep, we’ve put a significant amount of resources into fighting for marriage. A part of the reason for this is amatonormativity. Because marriage is seen as so essential, it’s a more palatable demand. People don’t want to admit that poverty is undeserved or that the US police force is a tool of white supremacy, but everyone loves a good wedding. Another reason is that weddings are profitable, while protecting our most vulnerable members of society is not. The wedding industry also depends on certain gender roles. One result of this is that it erases non-binary people: You can sell the idea that two brides need two dresses and two bachelorette parties and two bouquets, but it’s hard to invent a gender-based tradition for those who defy the gender binary. Additionally – as I mentioned before – amatonormativity excludes a lot of people on the asexual and aromantic spectrums. Aromantic people are excluded because of the emphasis of romantic love, while asexual people are excluded because our ideas around marriage perpetuate the idea that everyone experiences sexual attraction in the same way. It’s important to take a look at the normative ideas the wedding industry sells to us. Disabled people, fat people, non-binary people, and poor people are seldom represented in bridal magazines and at wedding expos. This lack of representation is very telling – it implies that we can’t have a perfect wedding, which in turn, implies that we can’t have a good marriage and a happy life. The diet industry is supported by the wedding industry because people – especially women – are encouraged to lose weight to be in the “perfect shape” for their wedding. For some, weight-loss is seen as an essential pre-wedding routine. These are just some of the issues with the wedding-industrial complex. The more you think about it, the more you unpack how the wedding industry depends on amatonormativity, which depends on a harmful representation of romantic love, which hurts the most vulnerable members of our society. I’ll be the first to admit that I love a good wedding. I swoon over floral arrangements in any context, cake is a top priority in my life, and I sincerely love the idea of celebrating love. But, at the same time, it’s important to view everything in context. Weddings take place in the context of an industry that feeds us toxic ideas about romantic love, and it’s important to be critical of those ideas.